Suzumiya Haruhi no Shoushitsu can be said as an indirect sequel to Suzumiya Haruhi no Yuuutsu in terms of title, storyline and popularity. It seems that it is appropriate to call this a very long side-story although it does contribute answers to missing questions in the prequel. It is mid-december, and SOS Brigade chief Haruhi Suzumiya announces that the Brigade is going to hold a Christmas party in their clubroom, with Japanese hotpot for dinner. The brigade members Kyon, Yuki Nagato, Mikuru Asahina and Itsuki Koizumi start preparing everything for the party, such as costumes and decorations. 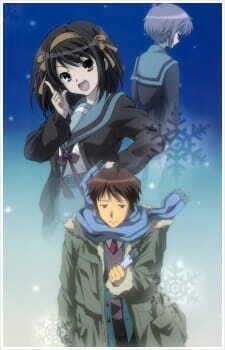 But a couple of days later, Kyon arrives at school only to find that Haruhi is missing. Not only that, but Mikuru claims she has never known Kyon before, Koizumi is also missing, and Yuki has become the sole member of the literature club. The SOS Brigade seems to have never existed, nor has Haruhi Suzumiya. No one in the school has ever heard about her… except for Kyon. As mentioned above, I would definitely portray this anime as a extra long side-story that explains the various mysteries surrounding the characters and the story arc itself. I found this OVA explained to me most of the answers that I needed. The story line was really well detailed from beginning to end. There were no "filler" moments or time-wasting dialogue. Everything was important to the tiniest of detail. This what makes the anime really enjoyable to watch. The art was technically the same as the prequel. As created by the same companies, the anime did include all the nice detailed featured from the prequel but with added extras. You will have to admire the redoing of the artwork when you watch the anime. You must watch the prequel to fully understand what is happening in this anime. Voice acting was generally the same. The same cast is back for each of the characters in the anime, as it should be for a sequel. The background music was all the same melancholy and dramatic. It suited the theme perfectly. The characters were the same as the prequel, however the interactions between them have grown stronger. The relationships and understandings really formed in the anime. Overall, I can't really say much here as I have already covered most of the details in my prequel review. Take this review as an "add-on" to my last one. In the end, this anime was above expectations and was really well animated in every way possible. A perfect sequel to an already interesting prequel. The story really did explain all the answers to questions from the prequel. Same good illustrated artwork and presentation once again. Same cast as expected. Voice acting was excellent. Loved the characters. Loved them even more in this anime. Once again a really well presented anime from start to finish. One awesome anime you definitely must watch!